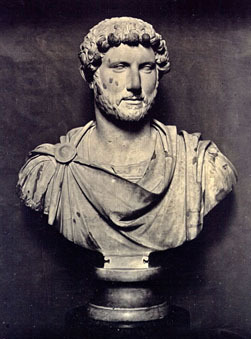 Hadrian, full name Publius Aelius Hadrianus, Roman emperor A.D. 117-138, was born on the 24th of January A.D. 76, at Italica in Hispania Baetica (according to others, at Rome), where his ancestors, originally from Hadria in Picenum, had been settled since the time of the Scipios. On his father's death in 85 or 86 he was placed under the guardianship of two fellow countrymen, his kinsman Ulpius Trajanus (afterwards the emperor Trajan), and Caclius Attianus (afterwards prefect of the praetorian guard). He spent the next five years at Rome, but at the age of fifteen he returned to his native place and entered upon a military career. He was soon, however, recalled to Rome by Trajan, and appointed to the offices of decemvir stlitibus judicandis, praefectus feriarum Latinarum, and sevir turmae equitum Romanorum. About 95 he was military tribune in lower Moesia. In 97 he was sent to upper Germany to convey the congratulations of the army to Trajan on his adoption by Nerva; and, in January of the following year, he hastened to announce the death of Nerva to Trajan at Cologne. Trajan, who had been set against Hadrian by reports of his extravagance, soon took him into favor again, chiefly owing to the goodwill of the empress Plotina, who brought about the marriage of Hadrian with (Vibia) Sabina, Trajan's great-niece. In 101 Hadrian was quaestor, in 105 tribune of the people, in 106 praetor. He served with distinction in both Dacian campaigns: in the second Trajan presented him with a valuable ring which he himself had received from Nerva, a token of regard which seemed to designate Hadrian as his successor. In 107 Hadrian was legatus praetorius of lower Pannonia, in 108 consul suffectus, in 112 archon at Athens, legatus in the Parthian campaign (113-117), in 117 consul designatus for the following year, in 119 consul for the third and last time only for four months. When Trajan, owing to a severe illness, decided to return home from the East, he left Hadrian in command of the army and governor of Syria. On the 9th of August 117, Hadrian, at Antioch, was informed of his adoption by Trajan, and, on the 11th, of the death of the latter at Selinus in Cilicia. According to Dio Cassius the adoption was entirely fictitious, the work of Plotina and Attianus, by whom Trajan's death was concealed for a few days in order to facilitate the elevation of Hadrian. Whichever may have been the truth, his succession was confirmed by the army and the senate. He hastened to propitiate the former by a donative of twice the usual amount, and excused his hasty acceptance of the throne to the senate by alleging the impatient zeal of the soldiers and the necessity of an imperator for the welfare of the state. Hadrian's first important act was to abandon as untenable the conquests of Trajan beyond the Euphrates (Assyria, Mesopotamia and Armenia), a recurrence to the traditional policy of Caesar Augustus. The provinces were unsettled, the barbarians on the borders restless and menacing, and Hadrian wisely judged that the old limits of Augustus afforded the most defensible frontier. Mesopotamia and Assyria were given back to the Parthians, and the Armenians were allowed a king of their own. From Antioch Hadrian set out for Dacia to punish the Roxolani, who, incensed by a reduction of the tribute hitherto paid them, had invaded the Danubian provinces. An arrangement was patched up, and while Hadrian was still in Dacia he received news of a conspiracy against his life. Four citizens of consular rank were accused of being concerned in it, and were put to death by order of the senate before he could interfere. Hurrying back to Rome, Hadrian endeavored to remove the unfavorable impression produced by the whole affair and to gain the goodwill of senate and people. He threw the responsibility for the executions upon the prefect of the praetorian guard, and swore that he would never punish a senator without the assent of the entire body, to which he expressed the utmost deference and consideration. Large sums of money and games and shows were provided for the people, and, in addition, all the arrears of taxation for the last fifteen years were cancelled and the bonds burnt in the Forum of Trajan. Trajan's scheme for the "alimentation" of poor children was carried out upon a larger scale under the superintendence of a special official called praefectus alimentorum. The record of Hadrian's journeys through all parts of the empire forms the chief authority for the events of his life down to his final settlement in the capital during his last years. They can only be briefly touched upon here. His first great journey probably lasted from 121 to 126. After traversing Gaul he visited the Germanic provinces on the Rhine, and crossed over to Britain (spring, 122), where he built the great rampart from the Tyne to the Solway, which bears the name Hadrian's Wall. He returned through Gaul into Spain, and then proceeded to Mauretania, where he suppressed an insurrection. A war with the Parthians was averted by a personal interview with their king (123). From the Parthian frontier he travelled through Asia Minor and the islands of the Aegean to Athens (autumn, 125), where he introduced various political and commercial changes, was initiated at the Eleusinia, and presided at the celebration of the greater Dionysia. After visiting Central Greece and Peloponnesus, he returned by way of Sicily to Rome (end of 126). The next year was spent at Rome, and, after a visit to Africa, he set out on his second great journey (September 128). He travelled by way of Athens, where he completed and dedicated the buildings begun during his first visit, chief of which was the Olympieum or temple of Olympian Zeus, on which occasion Hadrian himself assumed the name of Olympius. In the spring of 129 he visited Asia Minor and Syria, where he invited the kings and princes of the East to a meeting (probably at Samosata). Having passed the winter at Antioch, he set out for the south (spring, 130). He ordered Jerusalem to be rebuilt under the name of Aelia Capitolina, and made his way through Arabia to Egypt, where he restored the tomb of Pompey at Pelusium with great magnificence. After a short stay at Alexandria he took an excursion up the Nile, during which he lost his favorite Antinous. On the 21st of November 130, Hadrian (or at any rate his wife Sabina) heard the music which issued at sunrise from the statue of Memnon at Thebes. From Egypt Hadrian returned through Syria to Europe (his movements are obscure), but was obliged to hurry back to Palestine (spring, 133) to give his personal attention (this is denied by some historians) to the revolt of the Jews, which had broken out (autumn, 131, or spring, 132) after he had left Syria. The founding of a Roman colony on the site of Jerusalem and the prohibition of circumcision are said to have been the causes of the war, but authorities differ considerably as to this and as to the measures which followed the revolt, which lasted until 135. Leaving the conduct of affairs in the hands of his most capable general, Julius Severus, in the spring of 134 Hadrian returned to Rome. The remaining years of his life were spent partly in the capital, partly in his villa at Tibur. His health now began to fail, and it became necessary for him to choose a successor, as he had no children of his own. Against the advice of his relatives and friends he adopted L. Ceionius Commodus under the name of L. Aelius Caesar, who was in a feeble state of health and died on the 1st of January 138, before he had an opportunity of proving his capabilities. Hadrian then adopted Arrius Antoninus (Antoninus Pius) on condition that he should adopt M. Annius Verus (afterwards the emperor Marcus Aurelius) and the son of L. Aelius Caesar, L. Ceionius Commodus (afterwards the emperor Commodus). Hadrian died at Baiae on the 10th of July 138. He was without doubt one of the most capable emperors who ever occupied the throne, and devoted his great and varied talents to the interests of the state. One of his chief objects was the abolition of distinctions between the provinces and the mother country, finally carried out by Caracalla, while at the same time he did not neglect reforms that were urgently called for in Italy. Provincial governors were kept under strict supervision; extortion was practically unheard of; the jus Latii was bestowed upon several communities; special officials were instituted for the control of the finances; and the emperor's interest in provincial affairs was shown by his personal assumption of various municipal offices. New towns were founded and old ones restored; new streets were laid out, and aqueducts, temples and magnificent buildings constructed. In Italy itself the administration of justice and the finances required special attention. Four legati juridici (or simply juridici) of consular rank were appointed for Italy, who took over certain important judicial functions formerly exercised by local magistrates (cases of fideicommissa, the nomination of guardians). The judicial council (consiliarii Augusti, later called consistorium), composed of persons of the highest rank (especially jurists), became a permanent body of advisers, although merely consultative. Roman law owes much to Hadrian, who instructed Salvius Julianus to draw up an edictum perpetuum, to a great extent the basis of Justinian's Corpus juris. In the administration of finance, in addition to the remission of arrears already mentioned, a revision of claims was ordered to be made every fifteen years, thereby anticipating the "indictions." Direct collection of taxes by imperial procurators was substituted for the system of farming, and a special official (advocatus fisci) was instituted to look after the interests of the imperial treasury. The gift of "coronary gold" (aurum coronarium), presented to the emperor on certain occasions, was entirely remitted in the case of Italy, and partly in the case of the provinces. The administration of the postal service throughout the empire was taken over by the state, and municipal officials were relieved from the burden of maintaining the imperial posts. Humane regulations as to the treatment of slaves were strictly enforced; the master was forbidden to put his slave to death, but was obliged to bring him before a court of justice; if he ill-treated him it was a penal offense. The sale of slaves (male and female) for immoral and gladiatorial purposes was forbidden; the custom of putting all the household to death when their master was murdered was modified. The public baths were kept under strict supervision; the toga was ordered to be worn in public by senators and equites on solemn occasions; extravagant banquets were prohibited; rules were made to prevent the congestion of traffic in the streets. In military matters Hadrian was a strict disciplinarian, but his generosity and readiness to share their hardships endeared him to the soldiers. He effected a material and moral improvement in the conditions of service and mode of life, but in other respects he does not appear to have introduced any important military reforms. During his reign an advance was made in the direction of creating an organized body of servants at the disposal of the emperor by the appointment of equites to important administrative posts, without their having performed the militiae equestres. Among these posts were various procuratorships (chief of which was that of the imperial fisc), and the offices ab epistulis, a rationibus and a libellis (secretary, accountant, receiver of petitions). The prefect of the praetorian guard was now the most important person in the state next to the emperor, and subsequently became a supreme judge of appeal. Among the magnificent buildings erected by Hadrian mention may be made of the following: In the capital, the temple of Venus and Roma; his splendid mausoleum, which formed the groundwork of the castle of St. Angelo; the pantheon of Agrippa; the Basilica Neptuni; at Tibur the great villa 8 miles in extent, a kind of epitome of the world, with miniatures of the most celebrated places in the provinces. Athens, however, was the favorite site of his architectural labors; here he built the temple of Olympian Zeus, the Panhellenion, the Pantheon, the library, a gymnasium and a temple of Hera. Hadrian was fond of the society of learned men -- poets, scholars, rhetoricians and philosophers -- whom he alternately humored and ridiculed. In painting, sculpture and music he considered himself the equal of specialists. The architect Apollodorus of Damascus owed his banishment and death to his outspoken criticism of the emperor's plans. The sophist Favorinus was more politic; when reproached for yielding too readily to the emperor in some grammatical discussion, he replied that it was unwise to contradict the master of thirty legions. The Athenaeum owed its foundation to Hadrian. He was a man of considerable intellectual attainments, of prodigious memory, master of both Latin and Greek, and wrote prose and verse with equal facility. His taste, however, was curious; he preferred Cato the Elder, Quintus Ennius and Caelius Antipater to Cicero, Virgil and Sallust, the obscure poet Antimachus to Homer and Plato. As a writer he displayed great versatility. He composed an autobiography, published under the name of his freedman Phlegon; wrote speeches, fragments of two of which are preserved in inscriptions (a panegyric on his mother-in-law Matidia, andan address to the soldiers at Lambaesis in Africa). In imitation of Antimachus he wrote a work called Catachannae, probably a kind of miscellanea. The Latin and Greek anthologies contain about a dozen epigrams under his name. The letter of Hadrian to the consul Servianus (in Vopiscus, Vita Saturnini, 8) is no longer considered genuine. Hadrian's celebrated dying address to his soul may here be quoted: "Animula vagula, blandula, / Hospes comesque corporis, / Quae nunc abibis in loca / Pallidula, rigida, nudula; / Nec, ut soles, dabis jocos?" The character of Hadrian exhibits a mass of contradictions, well summed up by Spartianus (14.11). He was grave and gay, affable and dignified, cruel and gentle, mean and generous, eager for fame yet not vain, impulsive and cautious, secretive and open. He hated eminent qualities in others, but gathered around him the most distinguished men of the state; at one time affectionate towards his friends, at another he mistrusted and put them to death. In fact, he was only consistent in his inconsistency (semper in omnibus varius). Although he endeavored to win the popular favor, he was more feared than loved. A man of unnatural passions and grossly superstitious, he was an ardent lover of nature. But, with all his faults, he devoted himself so indefatigably to the service of the state, that the period of his reign could be characterized as a "golden age."